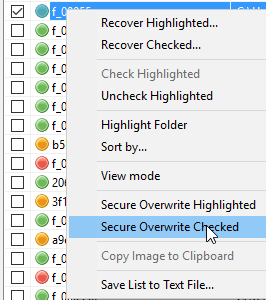 Add and option to rename the file and folder path after a secure delete. However, that is taking a lllllong time, as it handles the entire drive, whereas above option may only take care of 1 or a few files. BTW: wonder why this option (secure delete) isn't available in CCleaner? 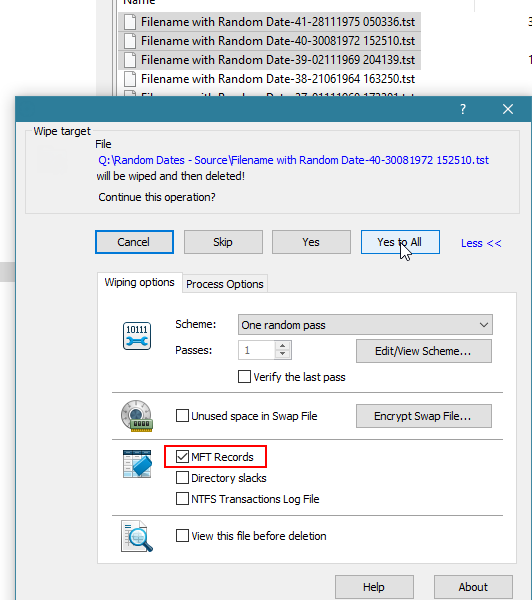 This option isn't available as it is not possible to modify the MFT (where the file and folder names are held). CC does this by renaming the file before deletion, which is legitimate. Secure file deletion is available in CC, but not on an individual file basis. I think there are tools that 'cover' MFT entries. The idea is that when running a recovery tool, the file itself may not be recoverable, but then again the folder or file-name may reveal what the contents is about. Yes, CC is one of those tools, but it deals with the MFT in an entirely different way from Recuva. There is no legitimate way to modify individual entries directly in the MFT whilst under the control of Windows (that I know of). The screenshot is from BCWipe, and as far as I can see concerns deleting live files. To 'wipe' the MFT entry of a live file all you need to do is rename it to random characters before deleting it, which is what CC, and apparently BCW, does (although BCW does it at a file level). You can't rename a deleted file, nor is there any way of asking NTFS to do it for you, which is why Recuva doesn't try. You can wipe the MFT with CC of course, and it would be nice if this were offerred as a separate option instead of having to run a full disk wipe.